Soils and surface waters along the Appalachian Mountain region, including the Great Smoky Mountains National Park (GRSM), have been impacted by acidic deposition. 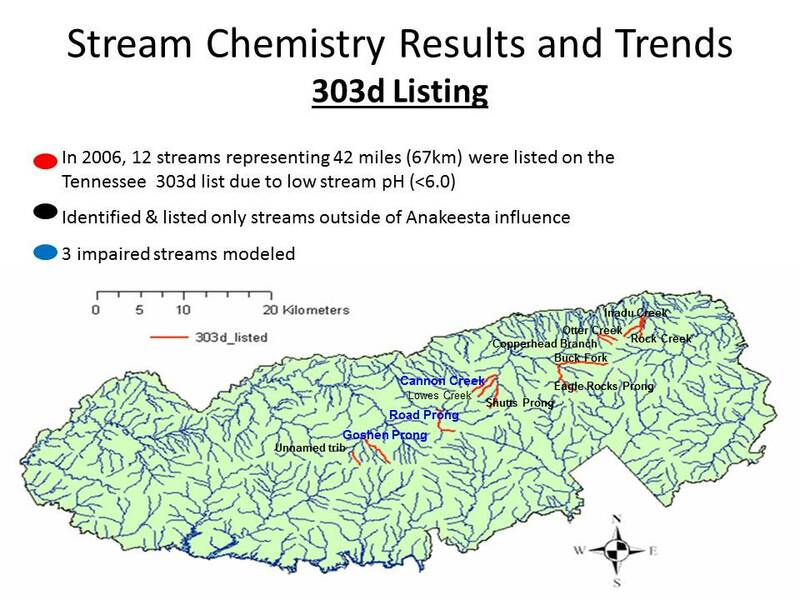 12 streams within the Great Smoky Mountains National Park were listed in 2006 by the state of Tennessee as impaired due to elevated acidity (pH< 6.0) under 303d of the clean Water Act (see figure below). The watershed hydrochemical model PnET-BGC is being applied to 12 stream-watersheds in the Great Smoky Mountains National Park to determine total maximum daily loads of acidity and critical loads of acidity for watersheds. To assess the response of streams and soils in the GRSM to past and potential future changes in the acidic deposition. To establish the Target Loads (TL) and Critical Loads (CL) for N and S deposition for watersheds of the GRSM. To explore the factors that control the critical loads in the GRSM. To compare results of simulations for GRSM watersheds to past and potential future changes in atmospheric deposition using PnET-BGC and MAGIC. Inform the process to develop a Total Maximum Daily Load (TMDL) for acidity for the GRSM and elsewhere. 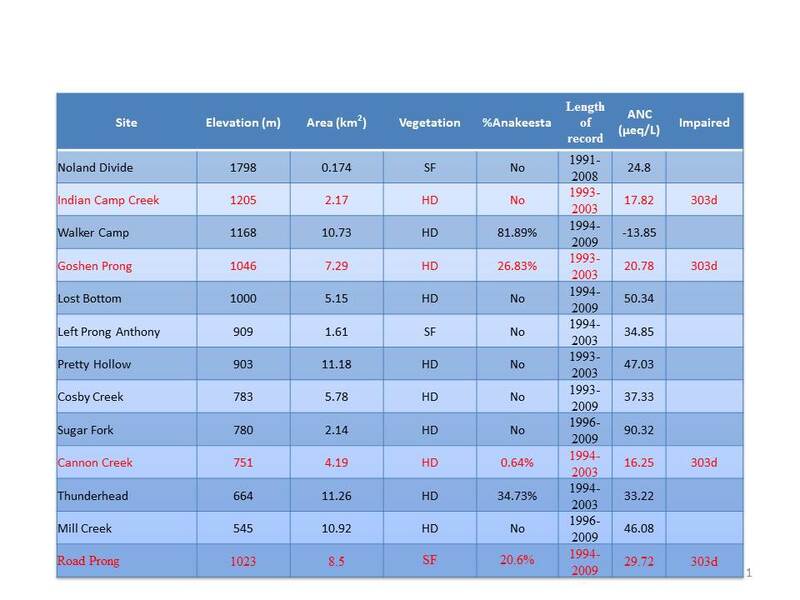 The model PnET-BGC was applied to 13 watersheds in the GRSM (see table below), including three acid impaired streams (303d listed). Historical conditions of meteorology, atmospheric deposition (see figure below) and land disturbance, future projections of atmospheric depositon and soil and vegetation parameters were developed as model inputs. Model hindcasts were simulated and future projections were made under a variety of scenarios of decreases in atmospheric sulfur and nitrogen deposition. 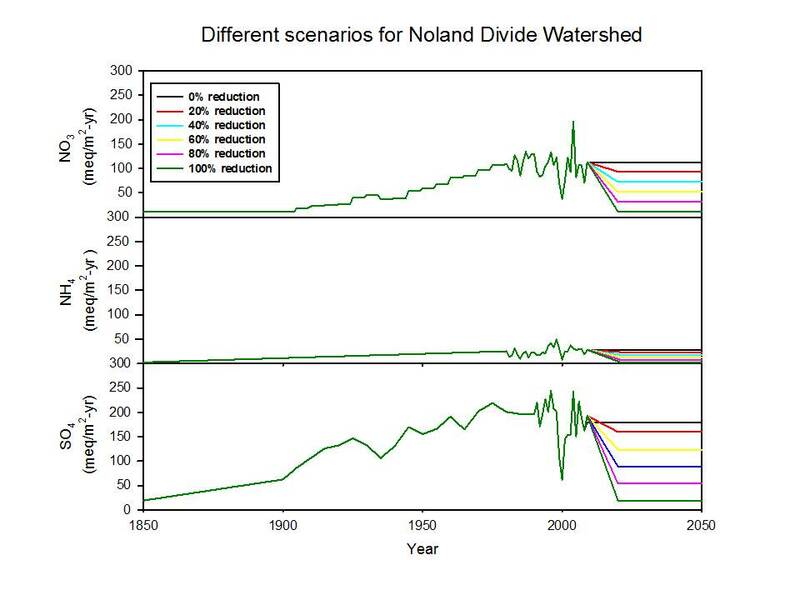 The response of streams and watersheds to future changes in atmospheric deposition was assessed (projections available under password protection).